Join us in transforming the way educators everywhere use video in the classroom. We are building a diverse company dedicated to making an impact in education. We welcome all people. We are committed to creating an inclusive culture where everyone is respected. Bring your talents, your passion, and your perspective. We value it all. We believe in working hard to transform the way educational video is used in the classroom—we also believe in having some fun along the way. Take a look behind the scenes at Boclips with our photo gallery. At Boclips we're passionate about helping educators bring the real world into the classroom, one video at a time. We know that when lessons are enhanced with videos, teachers are better able to put learning into context, simplify complex ideas, and make learning more engaging and fun for students. Our mission is to give teachers and courseware creators a smarter, safer way to access great videos so that more students can experience the proven benefits of video. Join us and you’ll be working with an awesome team doing challenging work and enriching classroom experiences with educational video. We’ve got growing teams in London, our hub for Product, Engineering and Content. And in USA, Singapore and UAE, where our teams are remote. But wherever you’re based, you'll find smart colleagues, an inspiring environment and somewhere you can make an impact. We want our team to feel happy, healthy and equipped with all the tools and support to do their best work. In London, our office is modern, light, thoughtfully-designed, and right in the heart of London. Our international teams are remote and based in states around the US, as well as Dubai and Singapore. From your first day you’ll have the equipment you need to do your best work. That usually means MacBook Pros or Airs and iMacs. We have a range of private health-care options for you and your dependents depending on where you are located. Other perks include free healthy food and drinks in the office. Professional growth is important to us. Every team member gets to choose how they want to spend their personal learning budget of £1500 a year. An offer is a financial package which includes a competitive base salary, target-based annual bonuses, stock options, and geography-specific benefits. We offer flexible schedules and remote working where needed. Teams also enjoy running, climbing together, gym sessions, and the occasional board game. Productive, healthy, and happy employees is paramount to us. With an in-depth knowledge of our users, our product team guides us to design and build the product that teachers and educators want. Embedded with our engineering team they are continuously iterating the user experience and have built our platform from conception, to launch, and ongoing iterative improvements. If you are a crisp communicator, love to strategise about product vision but can also talk about the bottom line, this is the team for you. Home to runners, musicians, rock climbers, gym-lovers, mothers, fathers, teachers, surfers, outdoor adventurers. 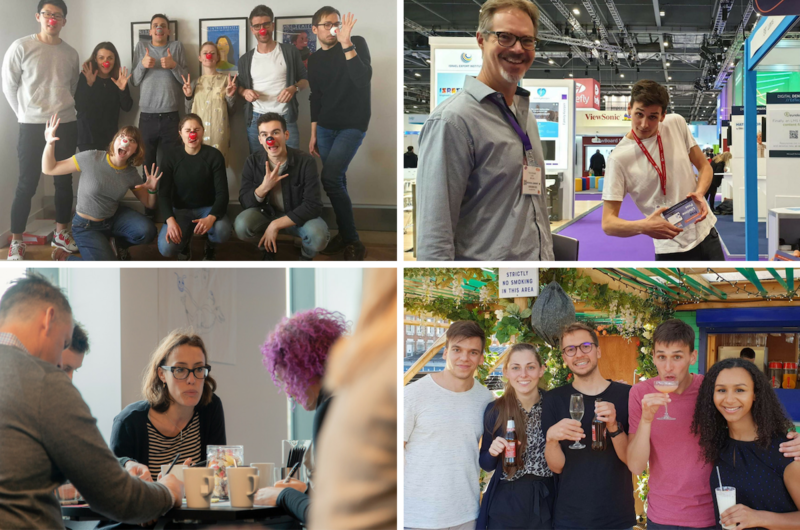 We are people from all around the world and we are regularly welcoming kind, humble and well-rounded software engineers onto the team. You won’t need to know our stack to get a job here. We care more about who you are and your potential than the skills you have today. We’ll ramp you up on anything needed to succeed. Prepare to learn fast. Finding and licensing great video that teachers and educators will love is at the heart of boclips. From talking to the giants of the broadcasting world who create or capture awe-inspiring moments, through to individual creators of perfectly-explained algebra. One thing is for sure, you’ll need to love watching videos. Our marketing team covers everything from content marketing to social strategy, digital ads, email campaigns, and website optimization. We also love to put on a great event that gets teachers excited about using Boclips in the classroom. If you’re equal parts intuitive and analytic with a knack for messaging and design and a love for all things digital, we need you to help us share the Boclips value proposition with the world. Know a thing or two about school districts in America, or MATs in UK? Do you know what it takes to build relationships with the ministries of education in Middle East and Asia? Knowing how our product could add value to the education sector and also to academic publishers is something we are very excited about. Our community team has deep knowledge of the power of Boclips. They are our teacher champions, on the frontline with our users helping them to onboard, find the right videos to inspire students and getting insights into the user experience. They are the voice of the teacher and usually have been teachers themselves. Designed to get to know each other better. We anchor our hiring process in the real world and what it would be like working together. We focus on the things that matter. Communication, collaboration and the ability to learn fast. You’ll hear from our head of talent who will want to know more about your aspirations and your professional growth so far, and she will share the Boclips story with you. Video call or in-person conversation with a member of the relevant team. Here we dial up the conversation around your fit and relevant experience for the role you are applying for. Here we’ll ask you to spend some time with the team or do a task related to the role. Whether it's pairing with our engineers for a morning or working through a prioritisation exercise with our product team, we’ll cover it in this step. By this point, we have a good feel for what you can do and hopefully you for us. We might be done after the 2nd interview or depending on the level of the position, there might be a C-level coffee and chat.